So after playing with the IR Sensor I decided that it was time to built something like a radar to detect objects and draw them on the screen. Obviously you can’t built a true radar with the sensors available with Mindstorms EV3 but you can get close enough ( for my needs ). 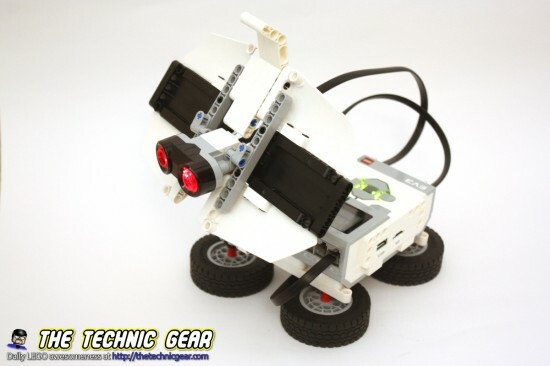 Using the Ultrasonic sensor from EV3 Education set I built this robot. The robot is just an Ultrasonic sensor mounted over one of the small turn tables and I use a M-motor to rotate it and a Touch sensor to make sure I don’t over-rotate it. There are a few ideas worth talking about on the above pseudocode. To initialize the position of the Ultrasonic sensor I just turn it to the right until the touch sensor state changes, that means that the motor reached the most left. If you just now turn the motor a bit to the right on each turn you will get the radar… but what happens when it reach the most right position? Right, you need to go left again. So how to do it? Have a look at the little Bouncing ball demo and you should get an idea. How do I draw the points? It is a very simple idea. We get the reading of distance from the Ultrasonic sensor and that would be a value ranging from 0 to 255, unfortunatelly our EV3 Brick has only 128 pixels high and I want a small margin on the bottom… I want the distance value in the range 0 to 118. Finally I draw a point on the screen without clearing the screen. And voila! 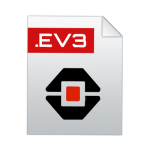 So using ideas from bouncing ball I wrote this EV3 app. There is a problem that you will notice if you scan close surfaces, and it is that what it is a line in real world will be a curve on the EV3 screen and that’s because there is no correction on the drawing. The EV3 readings belong to a semicircle and we are drawing a rectangle.